The shot put (pronounced /ˈʃɒt pʊt/) is a track and field event involving "putting" (pushing rather than throwing) a heavy spherical object—the shot—as far as possible. The shot put competition for men has been a part of the modern Olympics since their revival in 1896, and women's competition began in 1948. Homer mentions competitions of rock throwing by soldiers during the Siege of Troy but there is no record of any dead weights being thrown in Greek competitions. The first evidence for stone- or weight-throwing events were in the Scottish Highlands, and date back to approximately the first century. In the 16th century King Henry VIII was noted for his prowess in court competitions of weight and hammer throwing. The first events resembling the modern shot put likely occurred in the Middle Ages when soldiers held competitions in which they hurled cannonballs. Shot put competitions were first recorded in early 19th century Scotland, and were a part of the British Amateur Championships beginning in 1866. Competitors take their throw from inside a marked circle 2.135m (7.004593176 ft) in diameter, with a stopboard about 10 centimetres (3.9 in) high at the front of the circle. The distance thrown is measured from the inside of the circumference of the circle to the nearest mark made on the ground by the falling shot, with distances rounded down to the nearest centimetre under IAAF and WMA rules. Upon calling the athlete's name, the athlete may choose any part of the throwing circle to enter inside. They have thirty seconds to commence the throwing motion; otherwise it counts as a forfeit for the current match. The athlete may not wear gloves; IAAF rules permit the taping of individual fingers. The athlete must rest the shot close to the neck, and keep it tight to the neck throughout the motion. The shot must be released above the height of the shoulder, using only one hand. The athlete may touch the inside surface of the circle or toe board, but must not touch the top or outside of the circle or toe board, or the ground beyond the circle. Limbs may, however, extend over the lines of the circle in the air. The shot must land in the legal sector (34.92°) of the throwing area. The athlete must leave the throwing circle from the back. Does not pause within the circle before beginning the putting motion. Does not complete the putting movement within thirty seconds of having their name called. Allows the shot to drop below his shoulder or outside the vertical plane of his shoulder during the put. At any time if the shot loses contact with the neck then it is technically an illegal put. Puts a shot which either falls outside the throwing sector or touches a sector line on the initial impact. Leaves the circle before the shot has landed. Does not leave from the rear half of the circle. The athlete must enter the circle from the back (none of the rule books contain such a clause). The athlete entering the circle, then exiting and re-entering it prior to starting the throw results in a foul (all the rule books allow an athlete to leave a circle prior to starting a throw, but this still counts within the one-minute time limit; the allowable method of exiting the circle varies by rule book). Loose clothing, shoelaces, or long hair touching outside the circle during a throw, or an athlete bringing a towel into the circle and then throwing it out prior to the put, results in a foul. Shot put competitions have been held at the modern Summer Olympic Games since their inception in 1896, and it is also included as an event in the World Athletics Championships. Each competition has a set number of rounds of throws. Typically there are three preliminary rounds to determine qualification for the final, and then three more rounds in the final. Each competitor is credited with their longest throw, regardless of whether it was achieved in the preliminary or final rounds. The competitor with the longest legal put is declared the winner. In open competitions the men's shot weighs 7.260 kilograms (16.01 lb), and the women's shot weighs 4 kilograms (8.8 lb). Junior, school, and masters competitions often use different weights of shots, typically below the weights of those used in open competitions; the individual rules for each competition should be consulted in order to determine the correct weights to be used. Two putting styles are in current general use by shot put competitors: the glide and the spin. With all putting styles, the goal is to release the shot with maximum forward velocity at an angle of approximately forty-five degrees. The origin of this technique glide dates to 1951, when Parry O'Brien from the United States invented a technique that involved the putter facing backwards, rotating 180 degrees across the circle, and then tossing the shot. Unlike spin this technique is a linear movement. With this technique, a right-hand thrower would begin facing the rear of the circle, and then kick to the front with the left leg, while pushing off forcefully with the right. As the thrower crosses the circle, the hips twist toward the front, the left arm is swung out then pulled back tight, followed by the shoulders, and they then strike in a putting motion with their right arm. The key is to move quickly across the circle with as little air under the feet as possible, hence the name 'glide'. Also known as rotational technique. It was first practiced in Europe in the 1950s but did not receive much attention until the 1970s. In 1972 Aleksandr Baryshnikov set his first USSR record using a new putting style, the spin ("круговой мах" in Russian), invented by his coach Viktor Alexeyev. The spin involves rotating like a discus thrower and using rotational momentum for power. In 1976 Baryshnikov went on to set a world record of 22.00 m (72.18 ft) with his spin style, and was the first shot putter to cross the 22-meter mark. With this technique, a right-hand thrower faces the rear, and begins to spin on the ball of the left foot. The thrower comes around and faces the front of the circle and drives the right foot into the center of the circle. Finally, the thrower reaches for the front of the circle with the left foot, twisting the hips and shoulders like in the glide, and puts the shot. When the athlete executes the spin, the upper body is twisted hard to the right, so the imaginary lines created by the shoulders and hips are no longer parallel. This action builds up torque, and stretches the muscles, creating an involuntary elasticity in the muscles, providing extra power and momentum. When the athlete prepares to release, the left foot is firmly planted, causing the momentum and energy generated to be conserved, pushing the shot in an upward and outward direction. Another purpose of the spin is to build up a high rotational speed, by swinging the right leg initially, then to bring all the limbs in tightly, similar to a figure skater bringing in their arms while spinning to increase their speed. Once this fast speed is achieved the shot is released, transferring the energy into the shot put. Currently, most top male shot putters use the spin. However the glide remains popular since the technique leads to greater consistency compared to the rotational technique. Almost all throwers start by using the glide. Tomasz Majewski notes that although most athletes use the spin, he and some other top shot putters achieved success using this classic method (for example he became first to defend the Olympic title in 56 years). The world record by a male putter of 23.12 m (75 ft 10 in) by Randy Barnes was completed with the spin technique, while the second-best all-time put of 23.06 m (75 ft 7 3⁄4 in) by Ulf Timmermann was completed with the glide technique. The decision to glide or spin may need to be decided on an individual basis, determined by the thrower's size and power. Short throwers may benefit from the spin and taller throwers may benefit from the glide, but many throwers do not follow this guideline. The shot is made of different kinds of materials depending on its intended use. Materials used include sand, iron, cast iron, solid steel, stainless steel, brass, and synthetic materials like polyvinyl. Some metals are more dense than others making the size of the shot vary. For example, different materials are used to make indoor and outdoor shot - because damage to surroundings must be taken into account - so the latter are smaller. There are various size and weight standards for the implement that depend on the age and gender of the competitors as well as the national customs of the governing body. Randy Barnes also threw 23.10 m (1990). Ryan Crouser also threw 22.74m (2019) 22.65 m (2017), 22.53 m (2018), 22.52 m (2016), 22.47 m (2017), 22.43 m (2017). Ulf Timmermann also threw 22.62 m (1985), 22.61 m (1988), 22.60 m (1986), 22.56 m (1988), 22.55 m (i) (1989), 22.51 m (1986), 22.47 m (1986, 1988). Joe Kovacs also threw 22.56 m (2015). Tom Walsh also threw 22.45 m (2018). Brian Oldfield also threw 22.45 m (A) (1976). 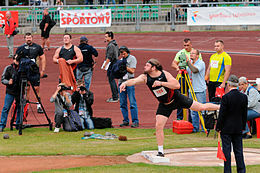 Christian Cantwell also threw 22.45 m (2006). Werner Günthör also threw 22.47 m (1987), 22.43 m (1987). Rolf Österreich of the East Germany threw a best of 22.11 on 12 September 1976 in Zschopau, but this mark was not recognized by East German authorities. Andrei Mikhnevich of Belarus threw 22.10 on 8 August 2011 in Minsk. This mark was annulled due to doping offense. Sergey Kasnauskas of Belarus threw 22.09 with an irregular implement on 23 August 1984 in Minsk. Best women's throw using a spin technique is 19.87m by Anita Márton and Jillian Camarena-Williams. Natalya Lisovskaya also threw 22.14m i (1987), 21.60m (1988). Helena Fibingerová also threw 21.75m i (1977), 21.66m (1977), 21.58m i (1977), 21.47m i (1985), 21.46m i (1977). Ilona Slupianek also threw 21.59m i (1979), 21.52m i (1980), 21.49m i (1980). ^ Colin White (31 December 2009). Projectile Dynamics in Sport: Principles and Applications. Taylor & Francis. pp. 131–. ISBN 978-0-415-47331-6. Retrieved 6 July 2011. ^ "Hammer Throw". IAAF. Retrieved 12 September 2015. ^ Shot Put - Introduction. IAAF. Retrieved on 2010-02-28. ^ "Outdoor: Shot Put: Area Records". Official website. International Association of Athletics Federations (IAAF). Retrieved 10 March 2011. ^ Shot Put - men - senior - outdoor. IAAF. Retrieved on 2014-01-24. ^ Shot Put - women - senior - outdoor. IAAF. Retrieved on 2014-01-24. ^ Jon Mulkeen (25 March 2018). "Walsh blasts Oceanian shot put record of 22.67m in Auckland". IAAF. Retrieved 27 March 2018. ^ Jon Mulkeen (18 May 2017). "Kovacs throws 22.57m, best in the world for 14 years". IAAF. Retrieved 20 May 2017. ^ Mike Rowbottom (31 August 2017). "Hill hits the shot put jackpot in Brussels' Place de la Monnaie – IAAF Diamond League". IAAF. Retrieved 2 September 2017. ^ "Shot Put Results" (PDF). sportresult.com. 9 July 2015. Archived from the original (PDF) on 5 March 2016. Retrieved 10 July 2015. ^ "Shot Put Results" (PDF). sportresult.com. 6 February 2018. Retrieved 8 February 2018. ^ "Shot Put Results" (PDF). zlatatretra.cz. 13 June 2018. Retrieved 19 June 2018. ^ Athens 2004 Athletics Medalists. Olympic.org. Retrieved on 2014-04-19.